Choosing a website template — is not an easy task when 1000 options are available. 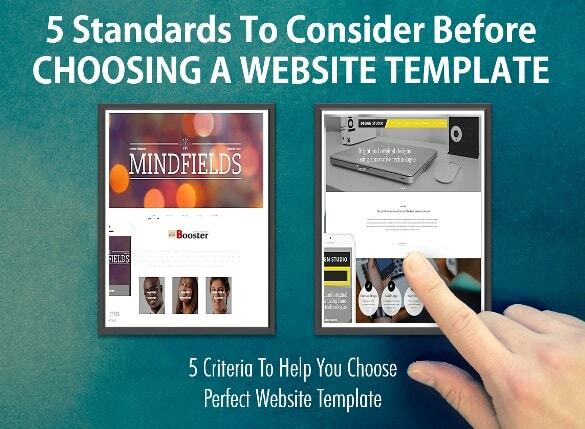 These following factors and standards will help you to decide and choose the perfect template for your website and your business. It depends on what they are looking for, be it a particular product or professional service. Only knowing the psychology of website visitors we can create a website that gets results. When visitors come to your website, they will produce a set of feelings whether positive or negative. A visually engaging website has the biggest impact on your visitors’ psychology and helps them to find the needed information quickly and with ease. Let's clean up what are the top priorities when selecting a perfect website template to establish trust and to make your visitors feel comfortable and engaging. You require knowing your business niche and purpose to choose the best website template. Website theme can also save your time, effort and money – if you decide the right one! There are lots of things to consider; The following factors will assist you to choose the template that's best for your website. Last time we already saw Best Selling Professional WordPress Templates | Premium Website Templates | SEO Optimized Templates but today we are going to see how to choose best WordPress template and what to look for and why to select perfect template for your website or blogger site or ecommerce site. First of all, try to analyze the general and desired features you want on your website, whether lots of big images, blog or even e-Commerce online store. You need to determine your business niche and business purpose to choose the best website template. Do you prefer a simple one-page website or do you need several pages? Should it function in the form of advertising? Figure out your business needs and goals in order to catch the most efficient and powerful template. Provide your audience with the certain place to show them your business mission, to build an audience by sharing valuable information. Another important thing when trying to find the perfect template for your website consists in choosing a template based on your users and visitors need. Decide what CMS platform is suitable for building your website, be it WordPress, Joomla, PrestaShop, Magento, WooComerce, Moto CMS templates, etc. It depends on your business requirements which one is the right choice for you. 1. What type of layout fits your needs? The solid layout of your website helps you to finish its structure properly and to highlight its important key elements such as size, positioning, user experience, etc. We used to believe that the layout should be completely unique and worth our clients’ money. Keeping it fairly simple has proven to be used more often in order to give your audience something usable, clean and professional. Uniqueness allows you to make your website’s design truly impressive, but it is important to remember that you don’t want to confuse or challenge your visitors but to provide them your exceptional content in a particular way. Best practice when creating the layout is in placing your major call-to-action headlines and button elements first and then building the structure around it. Remember, that in the modern world things are changing and evolving rapidly, thus you should be always ready to make swift changes and improvements as and when required. Every template needs some level of adjustment to fit your business wants. Website customization options allow you to refresh or to enhance your existing website templates and not require a complete redesign. There are no must-have customization options, but those necessary to create a visually engaging site that encourages your visitors to return. When users are overwhelmed with smart features and options, they will not be satisfied and lose their interest. Limit your visitors with some main options that are easy to understand and to navigate your website. Remember, that new features and heavy multimedia files influence your website’s fast download time and indicate how user-friendly it is. We don’t like when things go wrong, and we all need some help from time to time. When it comes to purchasing a premium website template that implies excellent 24/7 customer support. Be sure, it doesn’t really matter if the template you’ve chosen is simple enough; it must be supported by a technician expert who may answer any of your questions. Before buying read customer reviews and product reviews, make sure you can reach someone via phone, email or online chat, so you can really get assistance any time of the day and night. With an active custom support team, you may keep peace in mind that your website template will be updated to match the latest web standards and technologies. Among thousands of good-looking website templates, it’s very important to choose the one that combines a great design and usability. A perfect website template includes accessibility, readability, easy to use navigation, user interaction, and responsiveness. The responsively designed template allows displaying your website properly across multiple devices, regardless of screen size. Additionally, it should be mobile-friendly, with fast downloading speed, flexible and SEO-friendly. It should be great, accessible to search engines, compatible with all popular browsers to provide the best online user experience. Keeping in mind, all mentioned points, your perfect website template need to be not only a good-looking but should also fit your business requirements. Remember, you should never try to cut corners in order to find a cheap product, as a professionally developed website template, usually created both by web designer and programmer, is a perfect example of a wise investment that will be quickly paid for itself. Typography is another helpful option to develop emotions of your potential customers to feel about your business product or service. Using right typography, you can persuade them to love or to buy your product. A perfect website template can lead your visitors from one section to another using typography and font sizes. Regardless of what font you choose, you create a certain vibe, be it fun or serious, functional or informational. Be sure, that the fonts you choose are applicable across browsers and computers to display your website awkwardly. There are enough web design smart features and options to influence the psychology of your online users. Having a basic understanding of these design elements will allow you to make the design of your website template better, to affect your users and help them to interact with your brand. A perfect website template can help you to save your money and time when creating your website. Mind you; the right template will combine a great-looking design and a set of required smart features to give your website professional design and powerful functionality.